Tcherneva also comments on the need to reorient our broader policy approach (such that it exists) to combating inequality. One of the points she makes is that we give up too much terrain when we focus disproportionately on raising top marginal income tax rates. In the immediate postwar era, when government prioritized pro-employment and pro-wage policies, growth brought shared prosperity. Wages were rising in lockstep with productivity, public investment and public works were still a standard government response to downturns, the financial sector took only 7–15 percent of total corporate profits (compared to 30 percent today, after peaking at over 40 percent in the early 2000s), and long-term unemployment was a small share of total unemployment. The focus on pro-employment and pro-wage policies slowly weakened, but after the ‘70s the shift was decisive—away from labor markets and toward top marginal tax rates and financial markets. Returning to a more equitable variety of capitalism requires far more than just rolling back regressive tax cuts; it requires resuscitating and modernizing those labor-market focused policies left behind by the shift to a trickle-down, financial-sector-driven policy regime. 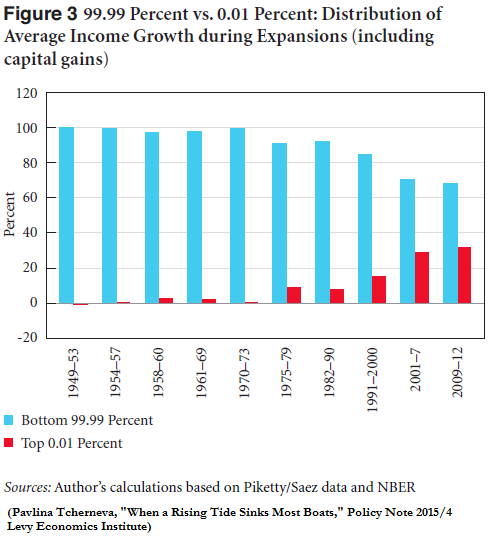 Tcherneva places part of the blame for post-1970s inequality trends on this shift in the policy approach toward stimulating economic growth. Returning to a policy (and growth) model focused on tight full employment and decent wages, she argues—including creating mechanisms to tie productivity gains to wage increases, addressing the gender wage gap, and providing a robust employment safety net—would help lead to improvements in the pre-tax, pre-transfer inequality that’s on display in her charts by raising incomes at the bottom and middle of the income scale faster than incomes at the top. Given that one of the more prominent economic policy discussions in this country these days hinges on the question of whether unemployment is (or will soon be) too low (such that, so the theory goes, we may need to throw more people out of work by raising interest rates), we’re likely quite a ways away from placing tight full employment back at the center of the debate. One might note the similarity of this trend in campaign contributions to Tcherneva’s chart of the top 0.01’s share of income growth. There are 2 things that should be done to make our national economy more stable, that is to reduce the poverty gap and stop the rise and fall of businesses cycles. Firstly we need to better understand what macroeconomics is about and to greatly improve in the ways it is being taught. The answer to this may be seen in a new book that I have just written and seen published, which look more broadly at the big picture, so as to better assess the way it works. (The book is titled: Consequential Macroeconomics” and serious students and their teachers may obtain a reviewer’s e-copy by writing to me at chesterdh@hotmail.com). Secondly we need to put in place a system of taxation which avoids the unfair advantage that wealthy land owners create when they speculate in the value of land and hold it out of use. Both of these actions tend to make living more costly and to place a heavier burden of the drain of a proportion of their incomes to the national purse. By taxing land values instead of production-related earnings, purchases and capital gains, there will be a greater equality of opportunity because entrepreneurs will find it easier to begin their businesses. This is due to more useful sites becoming available and for their competition for use becoming reduced. This means less rent per site and greater opportunities, lowers production costs, cheaper goods and more employment. The effect of land value taxation instead of taxing most other things is to stop the rising prices of sites from dominating the progress of the economy so that it will stabilize the macro-economy in the two ways mentioned above.